Nuremberg is full of historical, famous attractions: discover them during a guided “Old Town Walking Tour” and also dive into the impressive history of Nuremberg’s landmark: the Imperial Castle. 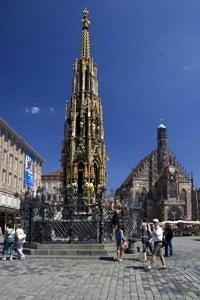 Nuremberg was once an imperial residence, a powerful free imperial city and an international trading center. 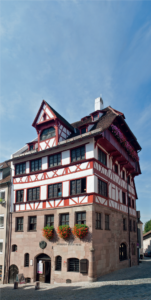 On the walking tour through the old town you will experience the flair of the Middle Ages as well as of modern times. 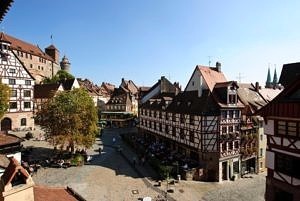 Learn about the culinary specialties of Nuremberg like grilled, spicy sausages and sweet gingerbread, a special delight to take home for your friends and family. As a highlight of our city tour, you will visit the imperial castle on the rocky promontory which is still called the crown of Nuremberg. This castle served as the location for numerous imperial assemblies and was the central location of the empire up until the 30-years-war. After the castle tour you will be able to peek down into the spectacular deep well and admire the craftmanship of the Middle Ages. As a last highlight you can enjoy the panoramic view from the Sinnwell tower and the courtyard and wonder at the fabulous reconstruction of the city after World War II. 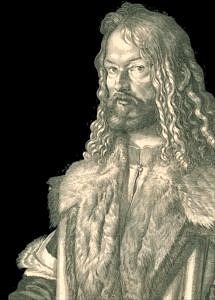 Agnes Dürer guides through Albrecht Dürer’s House. An actress portraying Agnes Dürer, the wife of the great Nuremberg artist, will guide visitors through her house in person. Complete with house mistress’ bonnet and large key-ring fixed to her apron, she meets the visitors and tells “inside stories”. So interested visitors may find out quite a bit about life and work in an artist’s household, about Agnes’ work in kitchen, workshop and house, about illustrious guests and (sometimes less than) industrious apprentices, about her dealings with money, and her (not always easy) relationship with Albrecht Dürer.